The Two Sicilies had belonged to Austria for about 14 years, when a war broke out between Austria and Spain. The allied States declared war against Austria in October, 1733, and their armies entered Italy together; but the Spaniards, intent on their long-cherished projects against Naples and Sicily, left the others and turned southward. The Infante Don Carlos, the younger son of Philip V. of Spain, by his second wife Elisabetta Farnese, of the house of Parma, invaded Naples by land in 1734, overthrew the Austrians, took possession of the capital, and carrying his arms beyond sea, made himself master of Sicily in the following year. The two kingdoms were easily and quickly conquered, the invaders having command of the sea and the favor of the population. Don Carlos was proclaimed king under the title of Carlos III, and the Bourbon Kingdom of the Two Sicilies thus came into existence. Britain's aversion to war thus resulted in the transfer of the central Mediterranean to a control necessarily unfriendly to Great Britain. In 1734 he was crowned at Palermo; in 1738 his title was acknowledged by the Treaty of Vienna; in 1744 he defeated the Austrians at Velletri, and compelled them to evacuate the kingdom; and in 1748 his title was acknowledged by the Treaty of Aix-la-Chapelle. 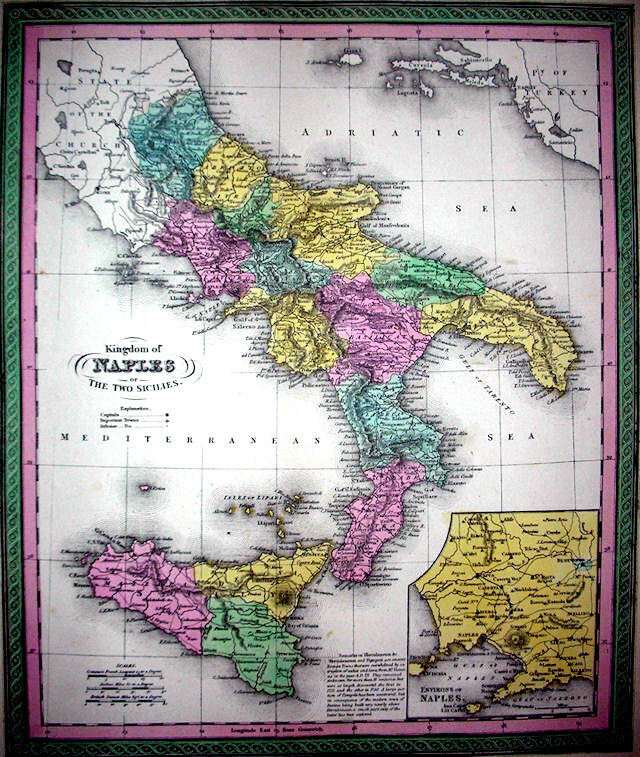 In 1734, the realm of Naples contained about 4,000,000 inhabitants. This small population comprised two classes of society- the feudal class, which inhabited baronial towns, and the demesnal class, which occupied royal burghs. The former, it is believed, constituted three-fourths of the people. The riches and prosperity of the two classes formed a striking contrast to their relative numbers. The demesnal population, governed by the viceroy, directly or indirectly, was in a thriving state; the feudal, subject to the barons and the clergy, was wretchedly situated. At the landing of the Infant Charles, Sicily contained about 1,000,000 inhabitants. This slender. population was, like the Neapolitan, divided into the feudal and demesnal classes, of which the former constituted five-eighths of the Sicilian people.,* Public industry, in all its branches, was in a sickly state. Recruited by means of a conscription, and by drafts from the galley-slaves, the military force was as formidable to the public peace as it was despicable to the foreign enemy. Well aware that the chief cause of Neapolitan misery was the overgrown power of the barons and the clergy, Charles III [r. 1734-1759] resolved to lay the axe to the root of the tree, and to attack the first principles of feudal authority. Laying down the maxim, that no one should come between the sovereign and the subject, he narrowed the feudal and ecclesiastical jurisdictions, took away the right of compounding punishments, and prohibited the barons from keeping men-at-arms to enforce judicial sentences. Charles III having succeeded in 1759 to the Spanish monarchy, upon the death of his father, Ferdinand VI. of Spain, relinquished the throne of Naples and Sicily to his third son, Ferdinand, agreably to the treaty of Aix-la-Chapelle, by which the future union of the Spanish and Italian crowns had been expressly forbidden. Ferdinand ascended the throne under the strange denomination of Ferdinand the Fourth of Naples and Third of Sicily. Ferdinand I [r. 1759-1806, over Sicily alone, 1806-1815], driven out of Naples by the French in 1799, took refuge in Sicily, where he met with a hearty welcome from a warm and generous people, deeply sympathising in his misfortunes. Sicily was at this time in a wretched condition. The population consisted of about 1,600,000 inhabitants, of whom the greater portion were still subject to the barons and clergy. Feudality, shaken to its centre, was not yet overthrown. From time immemorial the great nobles had interfered in the municipal elections, and tyrannized over the peasantry. The principal nobility, who drew their incomes from landed property, were overwhelmed with debts and embarrassed with law suits; the gentry or middle classes, who had mortgages on estates, were involved in difficulties, from which extrication was hopeless; and the lower orders, composed of labourers and mechanics, ill paid and ill fed, completed the picture of misery. The Court, instead of reducing its expenses to the level of its income, persisted in spending money until its funds were exhausted. Bankrupt in capital and credit, it resorted to fraud and oppression to replenish its treasury. Upon the abdication of Ferdinand, the vacant throne of Naples was usurped by Joseph Buonaparte, by whom it was occupied for about two years, from 1806 to 1808. At this epoch, the Neapolitan territory belonged to a small number of landlords, by whom it was let out upon long leases to middlemen or contractors. The larger portion was owned by the barons and the clergy, the smaller by the lawyers and men of capital, who had supplanted the lesser nobility. The great mass of the population was still struggling with poverty and want. The state of agriculture was deplorable. Large and lovely plains, once renowned for fertility, but now become barren, were covered with stones and rubbish. To encourage agriculture, by breaking up the royal demesne and by abolishing feudal rights, was the earliest endeavour of the new sovereign. On the 15th of July, 1808, Joseph Bonaparte [r. 1808 to 1815], who was created king of Spain by Napoleon, resigned the crown of Naples to his brother-inlaw, Joachim Murat. The first step taken by Joachim was to pursue the plan of policy laid down by his predecessor, for the destruction of feudal power. England, which had hitherto taken no part in the struggle between the Court and the parliament, moved at length by the wrongs of her own subjects, for which no redress could be had, and fearful lest the Sicilians, stung to madness by oppression, should throw themselves headlong into the arms of the French, now determined to interfere in the affairs of a country which she had long protected with a fleet and army, and enriched with an annual subsidy. Ferdinand yielded with a bad grace ; and on the 15th January, 1812, conferred the office of vicar-general upon the hereditary prince Francis, and appointed Lord William Bentinck, the British minister plenipotentiary, to the chief command of the Sicilian forces. But the king, was re-instated by a liberal ministry, and on the 16th July, 1814, Lord William Bentinck quitted Sicily for ever. On the 4th of June, 1815, Ferdinand arrived in tNaples;, he capital of the kingdom, and Joachim Murat, driven out by the Austrian forces, relinquished the throne of Naples to its ancient possessor, the exiled Ferdinand I [r. 1815-1825]. Ferdinand, on his return from Sicily, found his Neapolitan dominions in an improved condition. Agriculture and manufactures flourished under better institutions than formerly. Between Ferdinand's restoration in 1815, and his death in 1825, the progress of the Neapolitan population was slow but steady. A decree of the 11th December, 1816 ordered that all civil and ecclesiastical offices in Sicily should be filled by Sicilians, to the exclusion of Neapolitans, who, on the other hand, should occupy the civil and ecclesiastical offices of Naples, to the exclusion of Sicilians. Moreover it was provided, that Sicilians should be admitted to all the great offices of the state, in proportion to the number of the Sicilians to the population of the kingdom. As, therefore, the Sicilians formed only one-fourth of the whole population, so they should be admitted to one-fourth only of the seats in the council of state, leaving the remaining three-fourths to be filled by Neapolitans. Ferdinand I. was succeeded, on his death in 1825, by his eldest son, Francis [r. 1825-1830], whose reign of five years presents nothing remarkable respecting Sicily, and but little concerning Naples. With respect to the latter country, the chief objects of interest are the revival of domestic manufactures, the establishment of bounties for distant navigation, the endowment of a sinking fund, the introduction of the regia, or farming of the taxes, and the taking of a census. Upon the death of Francis in 1830, Ferdinand, his eldest son by his second wife the Infanta Isabella of Spain, succeeded to the throne under the title of Ferdinand II. Married 1st, in 1832, the Princess Maria Christina, daughter of Victor Emmanuel King of Sardinia; she died in 1836 after giving birth to Francis, Duke of Calabria, the hereditary Prince; 2nd, in 1837, her Imperial Highness Maria Teresa Isabella, daughter of the Archduke Charles of Austria, by whom he left nine children. Francis II. Duke of Calabria, proclaimed king on the 22nd of May 1859; married to Maria Amelia, daughter of the King of Bavaria, in January 1859. In consequence of the misrule of the three last kings of the House of Bourbon, the utmost discontent had taken possession of all classes, and had attained a state of revolution in 1859, when the successes of the French and Sardinians in N. Italy against the Austrians, the separation of Parma, Modena, Tuscany, and the Roman States, and their willing annexation to the new Italian kingdom, and the refusal of Francis II. to listen to any concessions, led to his downfall, after the siege of Gaeta, in February 1860, since which the Neapolitan kingdom has been annexed to the dominions of Victor Emmanuel, forming a population of 7,062,000. This great event was hastened by the invasion of Sicily by General Garibaldi, who, landing with a handful of brave fellows at Marsala on the 11th May, 1859, in a short period was able to liberate entirely that island from the Royal troops, and, traversing the provinces from Reggio at the head of his triumphant band, to enter Naples on the 7th September, the King retiring on Capua, and ultimately on Gaeta, where, after a brave defence, he delivered up his last stronghold to the Italian General, Cialdini. Since then, the ex-Royal Family lived in exile at Rome.